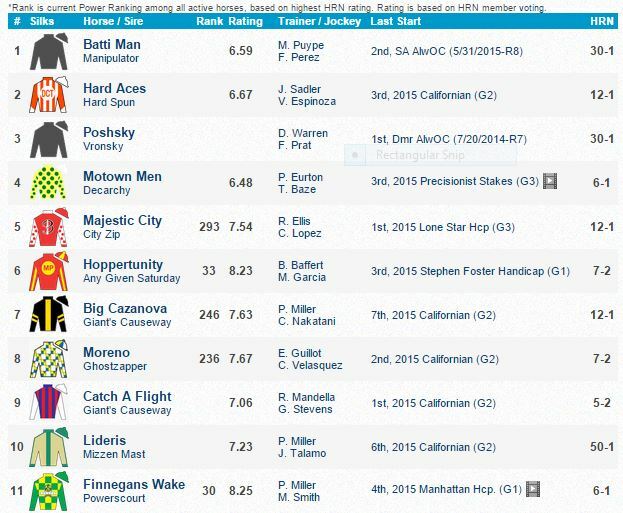 The 2015 Gold Cup at Santa Anita drew a field of 11 and Grade 2 Californian hero Catch a Flight is the 5-2 morning line favorite. Other contenders include graded stakes winners Hoppertunity (7-2), Moreno (7-2), and Finnegans Wake (6-1). 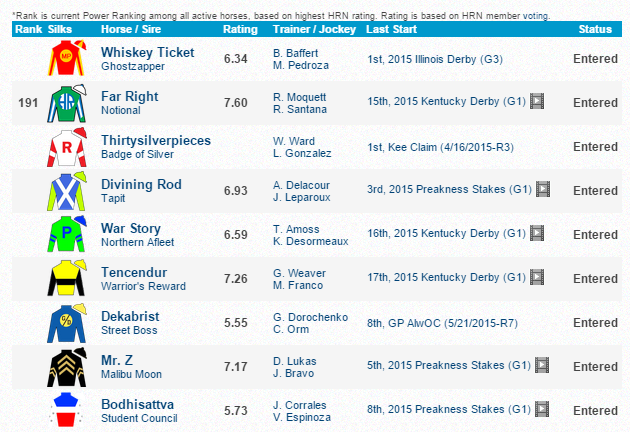 The 2015 Ohio Derby has a purse of $500,000 and drew a 9-horse field including Preakness show finisher Divining Rod. 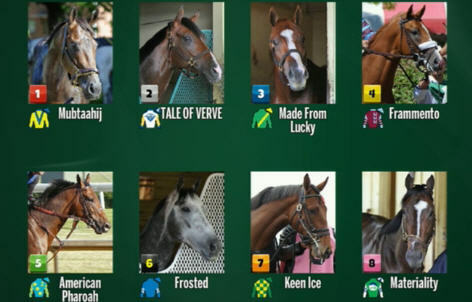 Six of the nine Ohio Derby entrants competed in the Kentucky Derby and/or Preakness Stakes (Far Right, Divining Rod, War Story, Tencendur, Mr. Z, and Bodhisattva) and three of the top contenders won graded races this year: Whiskey Ticket (G3 Illinois Derby), Far Right (G3 Southwest), Divining Rod (G3 Lexington). Untapable is the overwhelming morning line favorite and Wedding Toast might be the only one with a shot to beat her. This is a wide open race. Kentucky Oaks runner-up Shook Up is the tepid 7-2 morning line favorite. Other contenders include Promise Me Silver, 8-for-8 lifetime, and wire job threat Condo Commando. This might be the race of the day with Tonalist, Wicked Strong, and Bayern in the field. Quite possibly the toughest race on the program. Twilight Eclipse and Finnegans Wake figure to vie for favoritism. Will American Pharoah become the first horse to sweep the Triple Crown since 1978? History is against him but he seems to be coming up to the race as good as possible and should have every chance to succeed. The expected tepid pace should help his cause but it will not be an easy task with the likes of Grade 1 winners Frosted and Materiality in the field.